(£14,500 per year) and remission of fees. Other topics will be also considered as long as they align with the interests of the group. The appointed student is expected to work on a project that has a significant computational component. For this reason we expect that the successful candidate will have good background in computer science and programming. The application deadline is 30 November 2017 and the interviews will take place in the first half of December by Skype. The starting date of the PhD position is 1st Jan 2018 or any time as soon as possible after that. Experience in Computational Linguistics / Natural Language Processing, including at least some of the following Statistical Processing, Machine Learning and Deep Learning, applications to Natural Language Processing. Experience with programming languages such as Python, Java or R.
If not native speaker a IELTS certificate with a score of 6.5. If a certificate is not available at the time of application, the successful candidate must be able to obtain it within one month from the offer being made. Candidates from both UK/EU and non-EU can apply. Established by Prof Mitkov in 1998, the research group in Computational Linguistics delivers cutting-edge research in a number of NLP areas. This entry was posted in Uncategorized on November 24, 2017 by riilp. 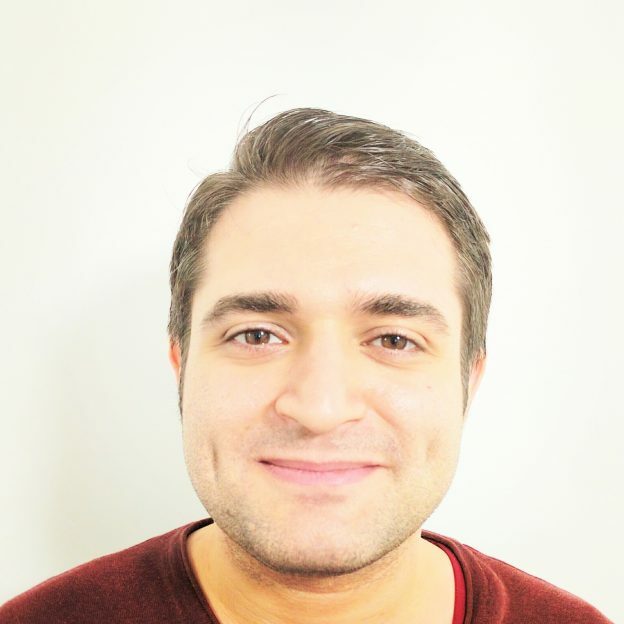 The Research Group in Computational Linguistics at the University of Wolverhampton is currently recruiting a Research Associate to conduct research on the AUTOR project which aims to help people with Autism read and understand text better (for more info on this project, please visit http://autor4autism.com/). As a Research Associate you will use relevant NLP technologies such as lexical, syntactic, and semantic processing to design and implement applications that can help AUTOR improve its core mission by developing educational assistance for people with autism. You should hold a Bachelor’s or Master’s degree, but ideally a PhD in Information Science, Computer Science or Natural Language Processing and experience in software development or employment in these fields. You should have experience of language technologies and resources and be willing to work as part of an extended team to research computational linguistics approaches to support the development of education-assistance tools for people with autism. Knowledge of machine learning is required. Interview dates to be confirmed. Start of the post to be agreed with the successful candidates. This is a temporary, zero hour contract. For informal discussion about the role please contact Dr Victoria Yaneva (v.yaneva@wlv.ac.uk). This entry was posted in news, Uncategorized on May 30, 2017 by riilp. 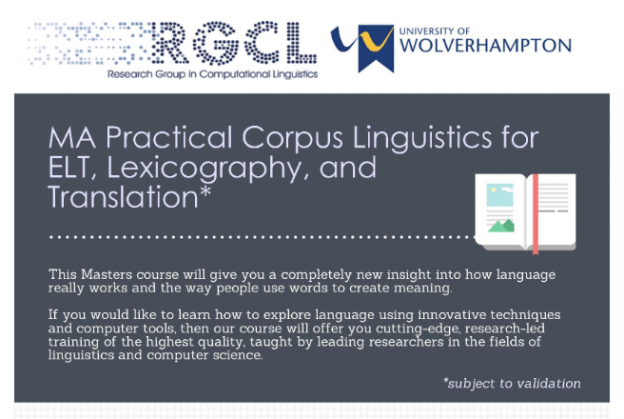 RGCL is proud to announce the new MSc in Practical Corpus Linguistics for ELT, Lexicography and Translation. For more detail visit http://rgcl.wlv.ac.uk/macorling/. This entry was posted in Uncategorized on December 22, 2016 by riilp. This entry was posted in Uncategorized on December 16, 2016 by riilp. 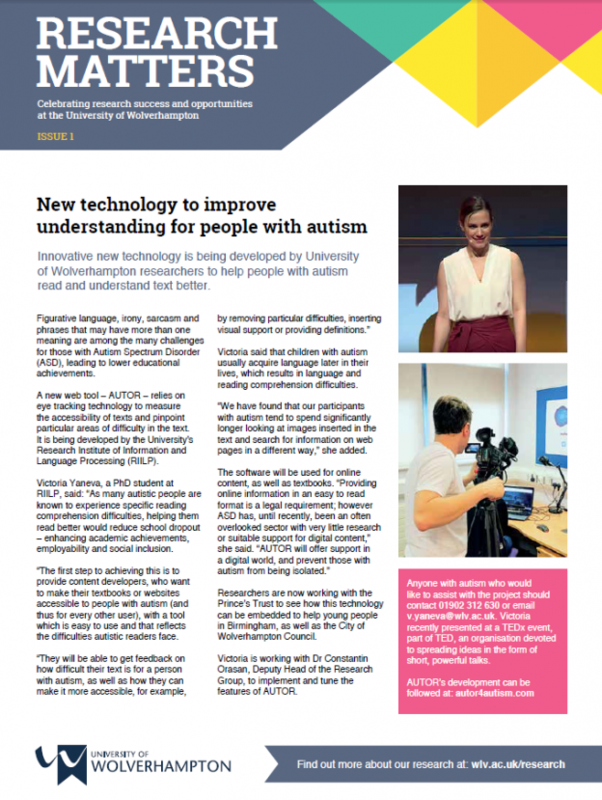 AUTOR has made the front page of University of Wolverhampton’s new research newsletter ‘RESEARCH MATTERS’ – we are delighted and honoured. The newsletter celebrates research success and opportunities at University of Wolverhampton. For anyone wanting to know more about AUTOR or how you can get involved in this great research contact Dr Victoria Yaneva either via telephone on 01902 321630 or email v.yaneva@wlv.ac.uk. AUTOR’s development can be followed at: www.autor4autism.com. This entry was posted in Uncategorized on December 14, 2016 by riilp. This entry was posted in Uncategorized on October 21, 2016 by riilp.